In today’s competitive marketplace sweets manufacturers need to provide the highest quality products. 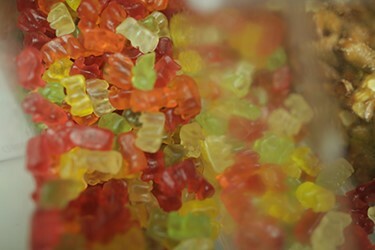 From inspecting for foreign body contaminants to complying with international food safety regulations, it is vital producers of jelly sweets, candies and hard gums implement effective food safety programs to safeguard their brand reputation and to prevent customer complaints. Producers of sweets face many challenges processing and packaging their product in different formats including individual film covers, stand-up resealable pouches for loose candies or metalised blister wrappers. Foreign bodies can contaminate the raw materials of sweets during any phase of the production process. They can arrive already inside the mixture of ingredients such as within the sugar, gelatin, corn syrup, natural and artificial flavouring and colouring ingredients and they can also be introduced at any stage during the processing phase. Proper portioning is another major concern for sweets manufacturers. Once sweets are packaged the individual packs can be underweight, overweight and individual sweets can be missed or broken. To overcome these issues, conventional methods require sweets manufacturers to either install a range of product inspection equipment on their production line – checkweighers, metal detectors, vision systems or just one solution – x-ray inspection. Using x-ray technology as an inspection method eliminates the need for multiple product inspection machines on one production line. X-ray systems can detect a wide range of foreign bodies such as metal, glass, mineral stone, calcified bone and plastic and rubber compounds, no matter what type of packaging. While inspecting sweets for contaminants, x-ray systems are capable of simultaneously perform various inline quality integrity checks including mass measurement, component count, missing and broken products at high line speeds. X-ray machines can be installed at various stages of the production process, from checking incoming ingredients such as sugar in bulk applications, to inspecting the final sealed packages. However, not all x-ray systems have the same detection capabilities. There are several factors to consider when selecting the right x-ray system for your company’s needs. Finding contaminants in products with complex density levels and multi textured- foods such as hard candies or jelly sweets can also prove challenging for traditional x-ray inspection systems. While standard x-ray systems provide unsurpassed detection of a wide range of dense physical contaminants including metal, glass and calcified bone, they are incapable of detecting thin glass or low-density plastics, rubber, stones and rocks in most products. Because Eagle understands the unique challenges sweets manufacturers face, we took x-ray technology a step further and developed the advanced Material Discrimination X-ray (MDX) Technology which enhances traditional x-ray inspection, providing sweets processors with unprecedented contaminant detection capabilities. Thanks to MDX, a dual-energy technology, contaminants can be removed before they reach further stages on the production process, helping sweets manufacturers to improve productivity and to reduce the volume of product rework. By enabling food contaminants to be removed before reaching the customer or supermarket shelves, MDX echnology can help to avoid product recalls, as well as play a key role in protecting manufacturers’ brands and the welfare of consumers. Hard Candy with glass, razor and stone Left: Traditional x-ray image - Software discriminates between the density of the product and the contaminant. If the density is similar the contaminant is difficult to detect. 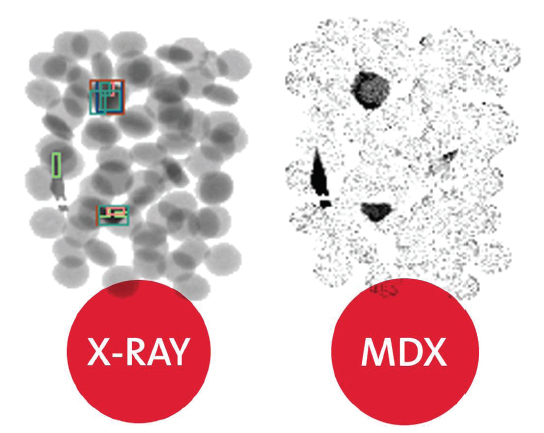 Right: MDX technology image - Advanced imaging makes contamination detection easier if product and contaminant have similar/same density.